Hi, I was hoping to be able to show a simple texture on some faces of my model. I had some difficulty getting the texture to show - seems the display mode must be higher than other object currently being used in the model for textures to show... Anyway, I have them showing now, but I expected the texture to be uniform across the face of my planar rectangular surface. It is, however, stretched across each of the sub triangles on the surface, which are of different sizes, which results in a very ugly look. Is there anything that can be done so that the scaling is uniform and that the edges of the texture would line up on that sub-triangles? Can you share also your shape? Hmm... How do I do that? I can share the code that built the shape which is very variable -- are you looking for the exact inputs for the shape in question (I could try to do that...) One I have my reference to the AIS_TexturedShape, can I do some kind of dump to share? Can I do some kind of dump to share? BRepTools::Write() exports TopoDS_Shape into file. 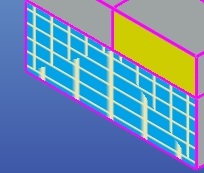 You shape consists of 3 Faces (see attached screenshot from CAD Assistant). 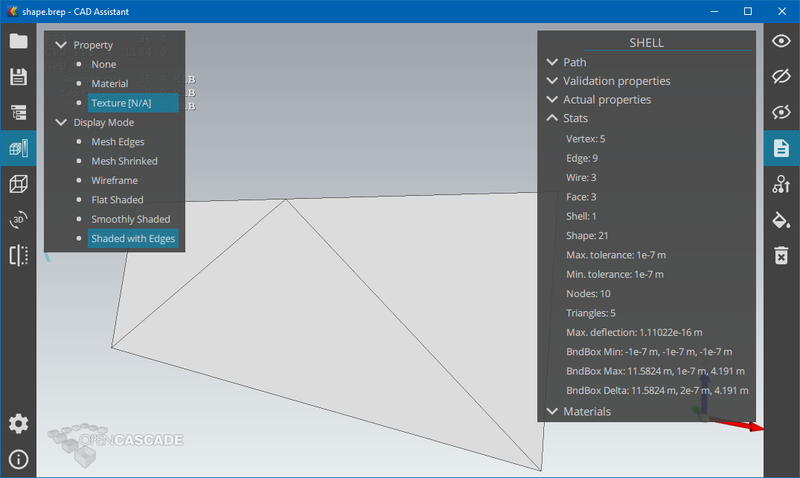 Standard presentation builder StdPrs_ShadedShape (used by AIS_TexturedShape) defines texture mapping UV coordinates from Surface parametric space individually for each Face. or compute UV texture coordinates manually using some alternative mapping logic (like projecting triangle nodes onto plane). (Graphic3d_Texture2Dplane/Graphic3d_TextureEnv, though these are rarely used due to limited use cases where such mapping makes sense). Thank you for you help, Krill. Yes, it was obvious to me up front there were 3 triangles, and each used the same ratio of scaling the image to fit the width/height, but unfortunately the overall widths were different resulting in different overall scalings. I want it to use the scales so that the overall image stretching is consistent for each triangle. Also, the origins should all align. It's not clear to me how I do the individual mapping given the AIS_TexturedShape -- is this possible? You cannot ask AIS_TexturedShape to map UV coordinates in your way, but you can define your own AIS presentation for that purpose. For that, you will have to learn how ::Compute() method works. StdPrs_ShadedShape is a tool computing shape presentation for AIS_Shape nowadays. In older OCCT versions there were more tools (more than actually needed) named differently for that purpose. Yes, it was obvious to me up front there were 3 triangles, and each used the same ratio of scaling the image to fit the width/height, but unfortunately the overall widths were different resulting in different overall scalings. It looks like a playing with parameters, but considering the origin of UV texture coordinates generated by AIS_TexturedShape (parametric space of underlying surface) - there might be no combination giving desired result despite the fact that these are just planar faces with simple boundaries. I would suggest using support services in case if you have problems solving your task using OCCT.